was a Japanese daimyo of the early Edo period, who was the founder of what became the Matsudaira house of Aizu. He was an important figure in the politics and philosophy of the early Tokugawa shogunate. Hoshina Masayuki was born in Edo, the illegitimate son of the 2nd shogun, Tokugawa Hidetada. Masayuki rose in prominence while his half-brother Tokugawa Iemitsu was shogun. Masayuki became lord of the Yamagata Domain and was then moved to the Aizu domain (Mutsu Province, 230,000 koku), and founded the Aizu-Hoshina line (known from his son's generation onward as the Aizu-Matsudaira) which was to remain enfeoffed there until the Boshin War. Masayuki was also a patron of Yamazaki Ansai, one of the early figures in Edo-era Japanese Neo-Confucianism, and together with him wrote the famous Aizu House Code, which included a direct injunction regarding the loyalty of the clan to the Shogun. In the house code set down by Masayuki, there was a specific injunction to serve the shogun with single-minded devotion, and it was this injunction which the family took great pains to show its adherence to, even if its true objectives were those of improving status and prestige. Having taken most of the steps toward self-deification, Masayuki was enshrined after his death as the kami Hanitsu-reishin (土津霊神), at the Hanitsu Shrine near Lake Inawashiro. Masayuki took good care of the farmers in his domain. He had strong kura storehouses build and kept rice, collecting it in years of good harvest and distributing it to the people in times of need. So his domain never experienced a real famine. He also provided rice to all people over 60 years, as a kind of pension for the elderly. Usually the elderly were treated as a burden to a poor farmer's family when they could not work any more to earn their bread. So his domain earned fame for being benevolent to its people. Masayuki never made use of his position as son to Hidetada and brother of Shogun Iemitsu, and kept in the background as best as he could. 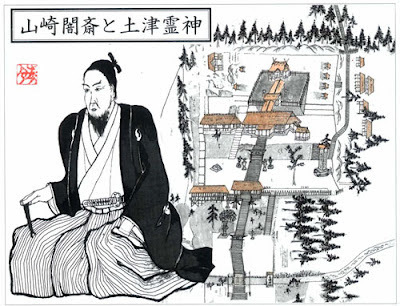 Domainal lord of Aizu (in present-day Fukushima Prefecture) in the early Edo period. His common names were Kōmatsumaru and Higo no Kami, and his posthumous name was Hanitsu Reishin. Born on the seventh day of the fifth month of 1611 as the fourth son of second Tokugawa Shōgun Hidetada (1579-1633), he was the half-brother of third Shōgun Iemitsu (1604-51). 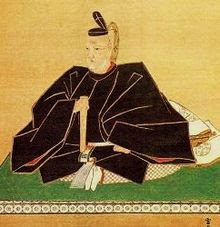 Hoshina initially became the adopted son of Hoshina Masamitsu, lord of Shinano Takatō Domain, and took the name Higo no Kami (Protector of Higo). In accordance with instructions left in Iemitsu's will, Hoshina was appointed regent to fourth Shōgun Ietsuna (1641-80) and thereafter played a key role in the Tokugawa government. Hoshina had a love of scholarship, and was especially interested in the study of Zhu Xi Neo-Confucianism and Shinto. Many Confucianists and Shinto scholars, such as Yoshikawa Koretari, Yamazaki Ansai, Hattori Ankyū, and Tomomatsu Ujioki, served as his retainers and collaborators. He was also close to the Hayashi lineage of official Confucian advisors to the shogunate. At his behest, Hayashi Razan instructed Ietsuna on the first section of the Confucian classic Great Learning (Jp. Daigaku). Hoshina's interest in scholarship led to his composing and editing many texts. Representative among these are Irakusanshiden shinroku (Record of the True Teachings Transmitted by the Cheng Brothers and Three Teachers), Gyokuzan kōgi furoku (Commentary on the Lecture at Yushan), Nitei chikyōryoku (Chronicle of Song Dynasty Political Thought), Aizu fudoki (Gazetteer of Aizu Domain), and Aizu jinja shi (Outline of the Shinto Shrines of Aizu Domain). 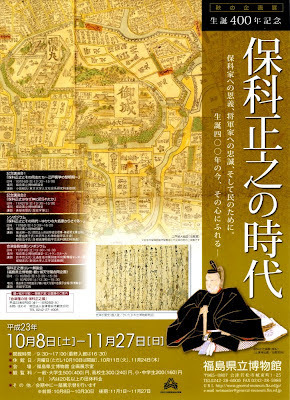 These works were employed by the Aizu domainal government to foster the education of local samurai retainers, improve local industry, and implement religious policies. Yoshikawa Koretari, in his capacity as representative of the Yoshida Shintō school, bestowed the Shinto spiritual title Hanitsu Reishin on Hoshina while the domain lord was still alive. Koretari also conferred the four secret transmissions of Yoshida Shintō on Hoshina in the year prior to his death. He died on the eighteenth day of the twelfth month of 1672 at the age of sixty-two.
. Beronaga べろ長 "the long tongue" . papermachee dolls from Aizu Wakamatsu .
. WASHOKU - Dishes from Aizu Wakamatsu .
. WKD : Sliding doors 障子 shooji . The Aizu Festival is one of the largest fall events in the Aizu Area. 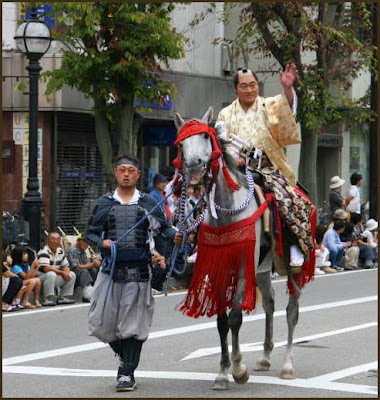 The main feature of the festival is the Aizu Hanko Gyoretsu, a procession of Aizu Domain Lords. Headed by flag bearers holding the flags of the successive feudal lords of the Aizu Domain, the procession is attended by participants representing well-known feudal lords such as Lord Uesugi, Lord Hoshina, and Lord Matsudaira and by a rank of people wearing garments and carrying tools associated with each of these lords. Each year, some 500 people parade through downtown Aizu in an event that magnificently recreates the world of samurai. Before the procession starts off, there is a kick-off ceremony at Tsurugajo Castle. Visitors can enjoy watching the sword dancing of the Byakkotai worriors and sword fight performances given by professional actors, with the castle keep of Tsurugajo in the background. "Izu the Wise" (知恵伊豆 Chie Izu).
. . . . . In his later years, he joined senior Tokugawa officials such as Hoshina Masayuki in supporting the underaged 4th shogun, Ietsuna. With Hoshina he planned how to rebuilt the town of Edo after the Meireki 明暦の大火 great Meireki fire.